SO CLEAN IT FEELS LIKE HOME! CHECK OUR RATES.....YOU WILL BE GLAD YOU DID. 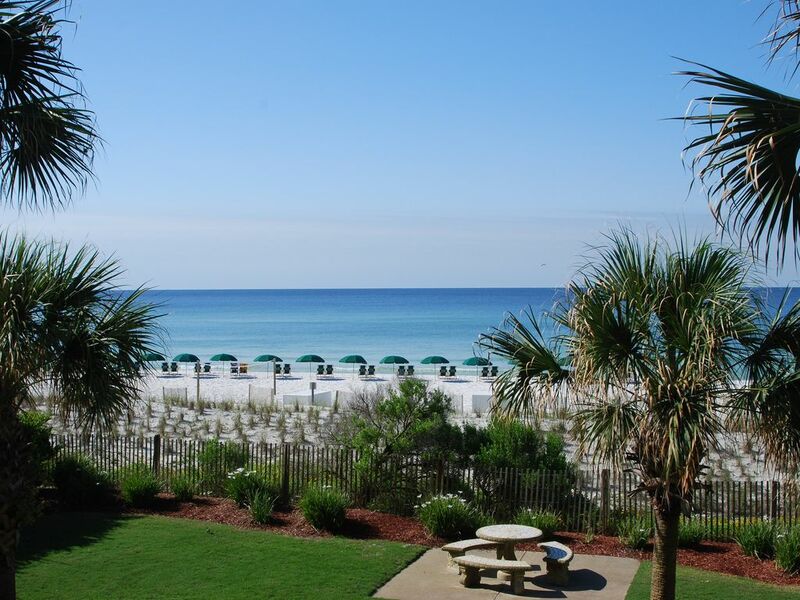 Imagine enjoying your beachfront view of the emerald green waters of the Gulf of Mexico and the sugar white sands of the beach on Okaloosa Island from your unit. The unit is located at the West end of the complex overlooking the beautifully landscaped grounds. The unit has a beachfront master bedroom with an amazing view of the ocean, a 2nd floor balcony, king-sized bed, walk-in closet, two vanities, a jetted tub and a glass shower. The second bedroom has a king-sized bed and lots of room. The third bedroom has a bathroom with a glass shower and a Queen size bed. Two bunks are built into the hallway providing easy access to the 2nd bathroom. Extra bedding is provided in the full-sized sofa bed located in the family room. There are TVs and DVD players in the family room and all bedrooms. All of the condo complexes located on Okaloosa Island are low rises, making the beaches much less crowded than other beaches of the Florida coast. We are located less than two miles from the Gulfarium, the fishing peer, and numerous excellent restaurants. Destin is located 6 miles away with many beautiful golf courses within minutes of the condo. 8. FREE Covered Parking - save your vehicle from the hot sun! 9. Elevators easily accessible- Building only 6 stories-no waiting! 14. Trash chute on same level - convenient! 20. Bright, cheerful colors throughout and the sound of the ocean waves will relax you from the moment you step inside this little piece of paradise. 23. Fully equipped gourmet kitchen with Bar Seating and Separate Dining Room, Microwave, Dishwasher, Side-by-side refrigerator with Ice Maker, granite countertops and all the conveniences of home. Here's a list of GREAT PLACES you should NOT MISS in the area!!! * Silver Sands Factory Outlet Mall ~ The Nations Largest!! * Pelican Adventures Dolphin Watching Tours! * Baytown Wharf in San Destin! Shopping, restaurants, lots to do! Come visit us at Water's edge, we promise you will return often. GOOD DATES ARE AVAILABLE at one of the best locations on Okaloosa Island. Life long residents of the state of Michigan. Retired couple with 4 children one grandson. Education degrees from Wayne State University. Retired teacher, coach and residential builder. Paradise. Gulf of Mexico. White clean sand beaches. The condo is located in a low rise area. Quiet area. You can find great restaurants, entertainment and recreation all within 5 miles or less! New leather furniture, HD TV's, full washer & dryer, new beds and most important, the unit is clean and feels like home. Come see for yourself......you will return. The condo is located beachfront on the second floor with the Gulf of Mexico as your neighbor. Enjoy a morning walk on the white sand beach while the dolphins play in the surf. Swim in the crystal clear ocean water or in one of the 5,000 square foot swimming pools. Surf fishing. Great restaurants are located with 2-5 miles of the condo. The condo unit also has a covered parking structure as well as a fitness center. Condo towel. Beach towels are not provided. EASY ACCESS TO ELEVATOR. COVERED WALKWAY FROM CONDO TO PARKING STRUCTURE. Granite countertops - stainless sink - snack bar with seating for 4. Pantry. 6 at table- 4 at bar or small table for 2. Paddle boards available at beach for a fee. We truly enjoyed our stay. The condo was as advertised, clean and perfect for our group. Communication with owner was smooth and easy. Thank you! We enjoyed the condo very much. Very clean and supplied with everything necessary to have a relaxing and enjoyable week. The beach set-up was great and he reserved our 4 chairs everyday for us. We plan on returning again in the future. Thank you for taking the time to review our beach front condo. We are glad you enjoyed your stay at the beach. Loved our week at Water's Edge on Fort Walton Beach! This was our group's first trip to the Panhandle and we were all very impressed. The condo was perfect for our group. Spacious, well appointed and conveniently located. The owner and manager were both easy to reach and responsive to all inquiries. The beach was awesome and the attendants (Abram and his trainee) were always mindful of our needs. We have traveled throughout Mexico and the Caribbean and the sand on this beach was as nice as any we have seen. Thanks to the Breuhans for allowing us to enjoy your property! We have had the opportunity to stay in this condo for the past 5 years. It is always move-in ready-just bring your clothes, food, and beach towels! Location to the beach, as well as 2 pools, makes it perfect for everyone. With a full front-view of the gulf, you can relax on the balcony. As far as the actual condo, it is very spacious and has close proximity to the elevator and staircase. This is very convenient since it is on the second floor. An outdoor BBQ patio with 4 charcoal grills is found on the premises. The grounds are meticulously maintained. Grocery stores, restaurants, and entertainment are numerous within a 2 mile radius. The owners are very easy to work with. If there are any issues, a local couple promptly responds to your needs. We enjoy this as being our home away from home. Thank you so much for being a returning renter for the past 5 years. We greatly appreciate the fact that you treat our condo as your own so that future guests can enjoy the unit as well. Great place and very relaxing. Been coming down for years and still the prettiest place ever. Thanks for taking the time to review the property. We enjoyed our vacation very much. This property was a great fit for our family. We were a family consisting of grandparents, parents, and grandchildren vacationing together. It can be hard to find the right size beds in one property to accommodate this type of group, so we were pleased with the setup. Also the bunk beds in the hallway worked out great for our situation. We found the furnishings very comfortable and clean, and the kitchen was adequately supplied even for the amount of cooking we did. Of course the main attraction was the beach and we loved being oceanfront with a great view! The pool was great, too! The beach service (chairs and umbrellas) provided was a definite plus! Thank you for sharing your property with us. We would definitely consider renting it again. Thank you for taking the time to review our condo. We are glad the unit was a great fit for your family. Paddle boarding & kayaking- rentals available on beach at Waters Edge.